We are a Washington DC based law firm specializing in the areas of Intellectual Property Management ( Patents, Trademarks, Copyrights, Licensing etc.) and United States Immigration. We also are able to provide a number of more general legal services. 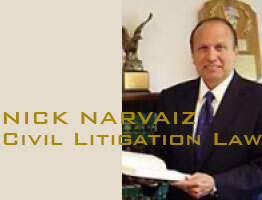 Attorney Rick Narvaiz offers experienced, personalized representation for businesses and individuals throughout the Washington, D.C. Metro area. Attorney Narvaiz has nearly 30 years of experience protecting his clients’ rights in real estate transactions, real estate litigation, business law, employment matters and civil litigation. Over the years, the lawyers at Clingan Tull Easley, PLLC, have represented countless clients in thousands of cases in Northern Virginia. Our firm aggressively defends the rights of our clients in every case and has established a strong reputation that is built upon hard work and aggressive advocacy. The attorneys and staff at our firm bring together years of experience and a winning attitude that serves our clients well. The Law Offices of Raymond T. McKenzie, Esq. As a firm, we believe in giving our clients an aggressive legal posture in the courtroom and the negotiating room, backed by empathy and respect in our personal dealings. In fact, we believe that our firms success follows from our commitment to this combination of vigorous representation and meaningful relationships with our clients. A well-informed client is an empowered client. Having worked for both large and small firms at the beginning of our careers, we strive to maintain the best of both worlds: the power and resources of a large firm combined with the more attentive approach of a small firm. Walton & Adams, PC – a full service law firm in Reston, Virginia – is highly respected and enjoys an excellent reputation with the Bench and Bar. For over 35 years, we have guided our clients in their most important and challenging needs – in business, litigation, corporate, employment and real estate. We strive to provide both individual and business clients with knowledgeable advice, personal attention, and ethical representation in every case. Walton & Adams has been selected by a national publication as a “Go to Law Firm” for the Top 500 Companies, and our attorneys have been individually recognized as preeminent in the Washington D.C. area and in Virginia in their respective areas of concentration. Our Arlington civil litigation attorneys advise clients of the potential costs and benefits of litigation and tailor their strategies to the goals, expectations and resources of each client. We provide each client with an early case assessment and maintain active communication so the client may establish realistic goals and make informed decisions throughout the course of the litigation process. We consult with each client about settlement options and work with each client to achieve the best possible resolution of the case. Caulkins & Bruce represents clients in mediations and arbitrations before the American Arbitration Association, JAMS and other private alternate dispute resolution services. However, when a matter cannot be resolved out of court, our lawyers are prepared to take the case to trial.